My family loves soup and I make it for them at least once a week. Crab is the perfect ingredient to elevate that tried and true recipe from boring to extraordinary. I happen to love tomatoes and at the end of the season this is a great way to use up all those “less than perfect” tomatoes that might not be quite perfect enough to make the plate on that Caprese salad. In the cooler months, you can easily substitute high quality canned tomatoes to give a little break from the cold Winter months with a Summertime classic. Add all ingredients, except the garnish items, to a blender and puree until smooth. Add reserved liquid from the drained tomatoes to adjust the consistency. Allow to chill under refrigeration for at least 1 hour. Season with salt, pepper and vinegar, if needed, prior to serving. 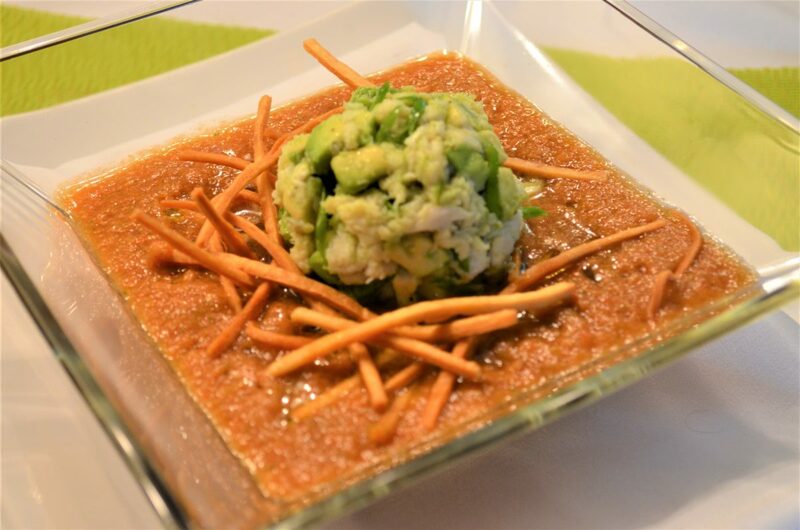 Portion and garnish with the crab, avocado, scallions and tortilla strips.